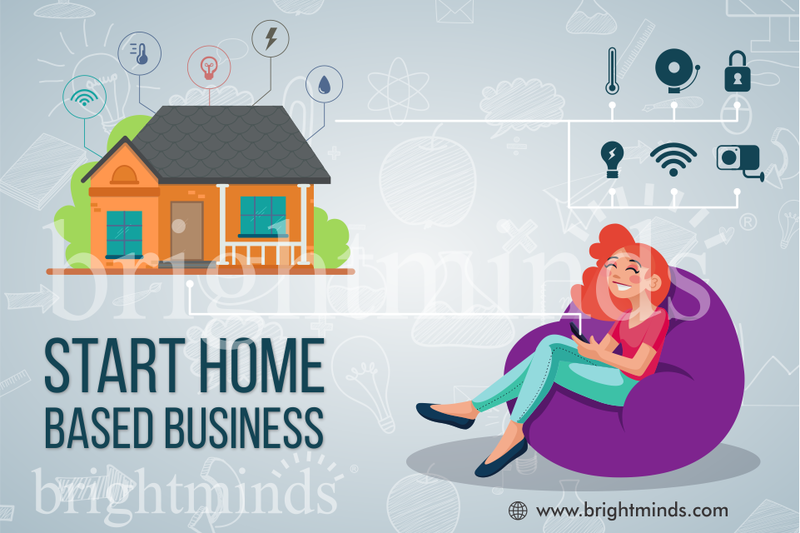 First you must understand the Brightminds Franchise proposal completely. 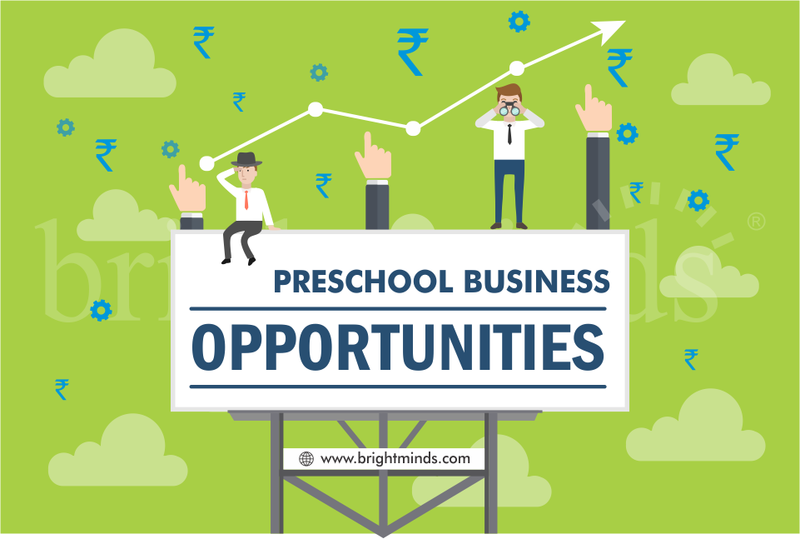 Brightminds Franchise basic requirement for preschool or Playschool is minimum specified space and investment amount inclusive franchise fee. Franchise Fee: 1, 25,000 INR excluding GST for 3 year tenure. These are the minimum cost to start a play school or Preschool. There mustn’t be any doubt left in your mind. If any doubt still exists, we are happy to help you. 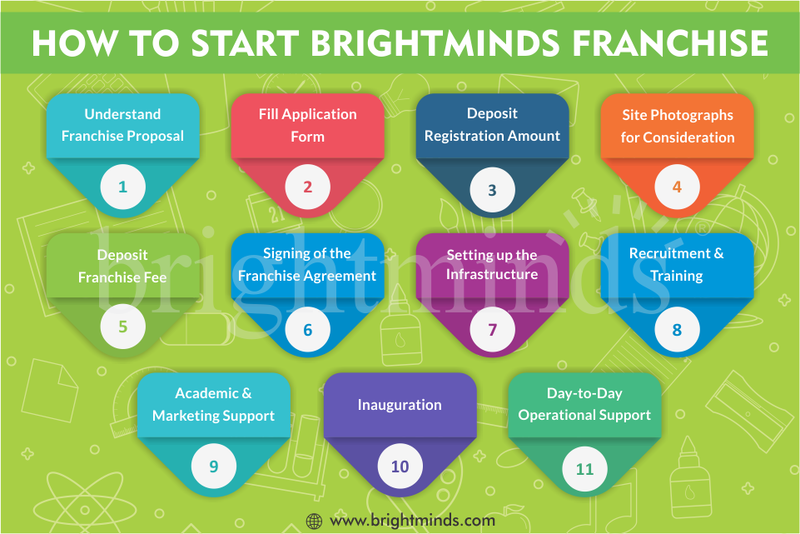 Understanding Brightminds proposal and continuous discussion with Brightminds Franchise development team, you will get an application form to be filled and resend to us after filling all the required details. 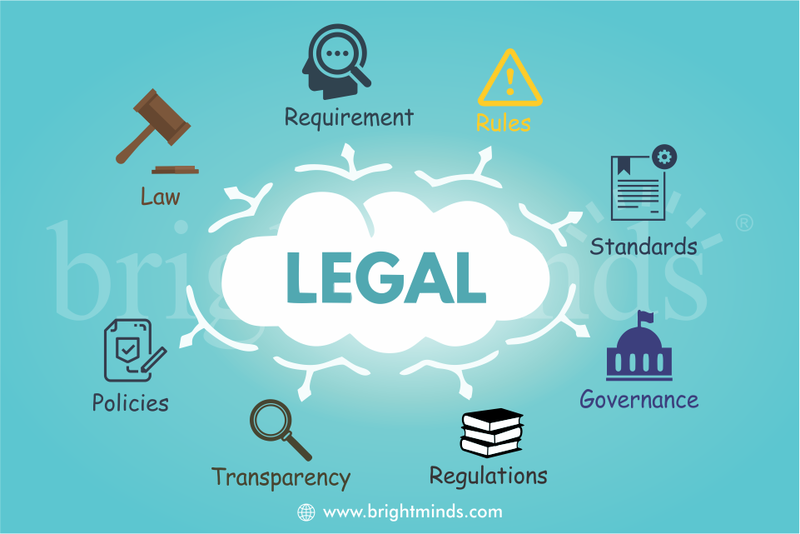 If your query gets satisfied and feel very much confident to go with Brightminds then you will have to follow next step of Registration and deposit the token amount of registration in Brightminds Account. Site selection is very important stage as without this you cannot move forward to complete this franchise process. You have to send proposed site photographs in good quality for the purpose of site consideration. Suggestion for Preschool or Playschool Location – You are suggested to search location in a residential populated area and be confirmed that preferable space is at Ground Floor with good front view. 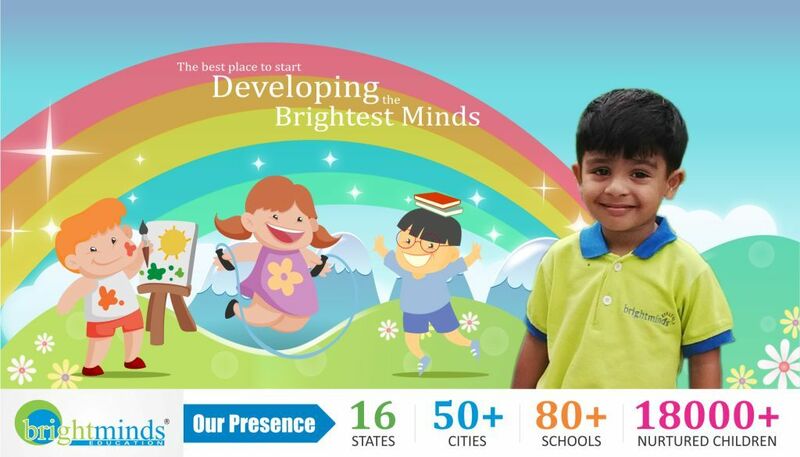 You are going to be associated with a National recognized Brand “Brightminds” that will permit you to approach its Brand Name with Value, R & D team for curriculum and development, so you will need to pay Brand License or Franchise fee. At this juncture you need to deposit the mutual decided franchise fee, and move to the next step of Franchise Agreement done. It is an agreement between Franchisor and Franchisee. Where both of you agreed on certain defined term and condition placed by franchisor end. This agreement will carry the condition like franchisee fee amount, franchise tenure, Franchisor and franchise obligatory clause, intellectual property rights etc. 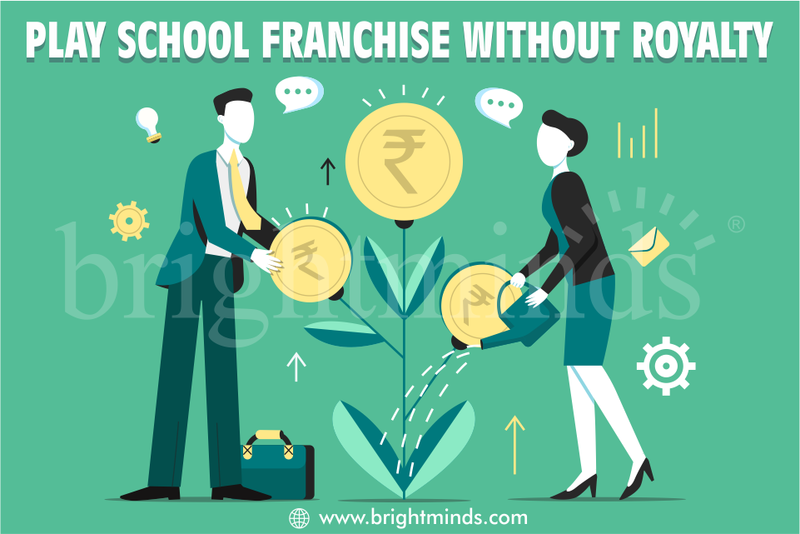 After receiving the franchise fee, Brightminds will send a franchisee agreement in written and in original form through speed post to your correspondence address mentioned in franchise application form. As you receive this, put your sign on specified space and done franchise agreement stamped with 500 INR non-judicial stamps. Now you have to send that signed and stamped franchise agreement to Brightminds in original form through speed post. 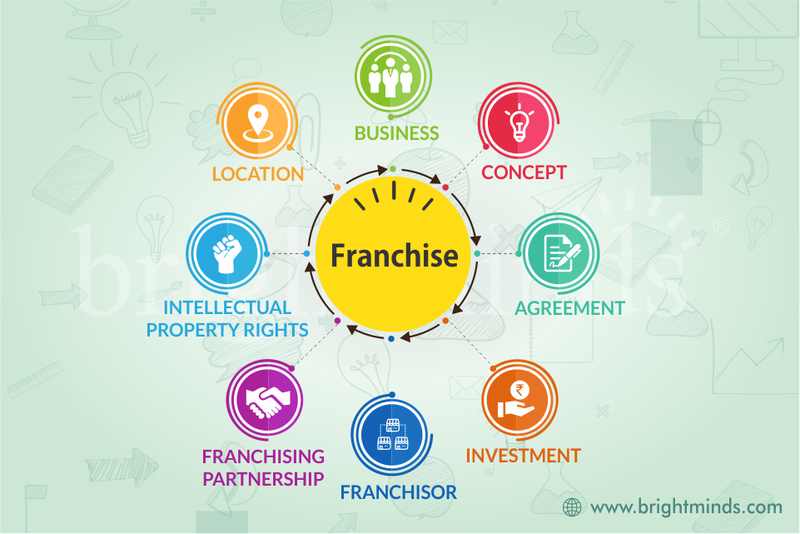 You will get franchise license certificate from the Brightminds on behalf of this franchise agreement. Our team will assist you to set the infra materials as per Brightminds standard and build your preschool or playschool infra set up. If you are interested to develop child friendly interior then our team will guide suitable thematic wall painting design. That will enhance the probability of involvement of kids. Brightminds infrastructure Set up includes lots of attractive thematic colorful furniture, toys, play equipments, teaching articles and modern educational stuff. It also Contains Cognitive learning, physical motor skills development, Montessori teaching equipments etc. It is very important to take care of the safety aspect of the kids also. While doing the interiors you must take care of the fact that the whole area of your playschool is safe for small children. For running a successful preschool there should be a good reliable working team. Brightminds assist or guide you the selection procedure for selecting good working staff. There should be two types of working staff, one teaching while other non-teaching. For teaching staff eligibility criteria should not be less than higher secondary education and caring with learning attitude. 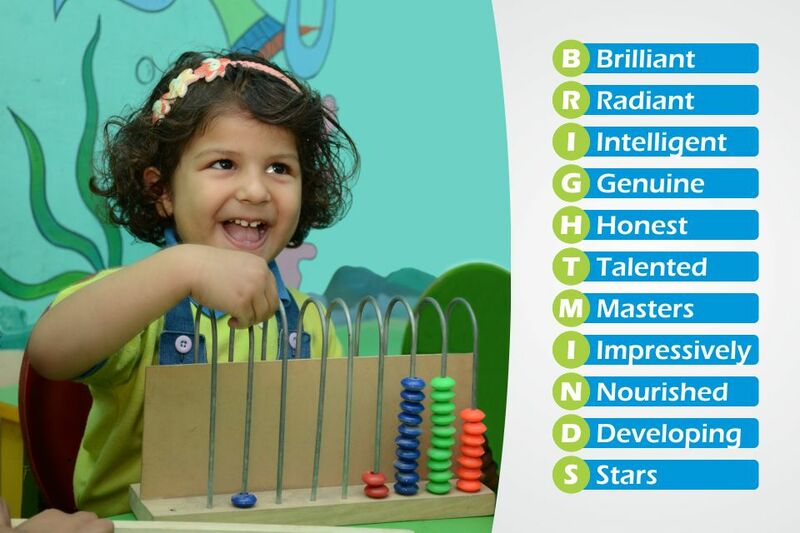 Brightminds will provide training to these teaching staff that will be very beneficial for improving their skill with pedagogical practices, assessment patterns and teaching style. We will provide you the best Curriculum as per current scenario. It takes time, hard work and complete knowledge of the subject as well as latest pedagogical practices, assessment patterns and learning styles to design an excellent curriculum that will be provided to you. We will help you to implement the curriculum in perfect way. 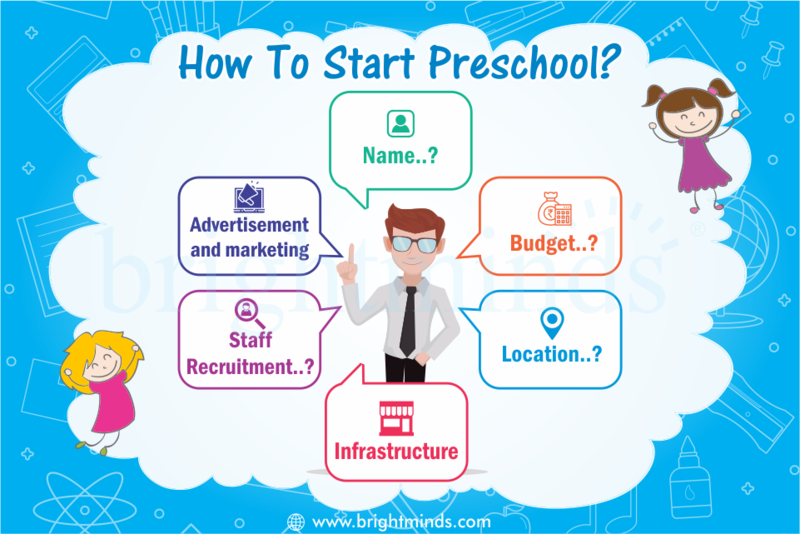 We will also guide you in making strategies for marketing your preschool in your locality that will make people to visit your preschool and enroll their kids. We also do advertisement and marketing on social media and digital marketing for you. For making people living around your preschool location aware about your work and profession, it is necessary to organize a fest for them. So inauguration is the activities that will make them aware about your work and will help to build your preschool image from the very beginning. Prepare the launch of the preschool with full flash. Do as much as marketing possible. Do different activities to get attraction on the launch and try to invite some special chief guest for the inauguration. As you step in to the new industry of education, you will require day to day guidance so that you can move step by step. We will provide day to day running support for running your preschool in perfect manner. You will feel Brightminds always with you at aisle to make you run the preschool. Brightminds also provide a Web based ERP integrated system that helps you manage the entire preschool management system. - Narendra bahadur adhikari "05-12-2018"